Ok, we did have a previous ship date. Printed copies of Wind Energy for the Rest of Us were to arrive in the warehouse at the end of October. Obviously, that didn’t happen--and for good reason. I called a halt. Quad/Graphics delivered “blues” to me nearly a month ago. Why they are called blues was never explained. As the publisher of this book it’s assumed I know all these terms. . . The blues are copies of each signature of 16 sheets with pages two up. They also ship some laser prints, effectively photographic prints, of selected pages to gage reproduction quality. As the author, photographer, and now publisher of this book it was heartbreaking to see many of the images—and there are more than 400 illustrations of one kind or another—were too dark. After consultation with the designer, I shipped the blues to him and they had to do new color separations of all the problematic images. This delayed printing by about three weeks. A second set of blues were delivered here Friday morning. By noon I’d looked through all the signatures, signed them, and had them at FedEx. Quad/Graphics tells me the new ship date is 8 November, the same date as the US election. I am not sure if I should read any meaning into the alignment of those two events. Time will tell. . .
Once the books arrive in the warehouse, we can begin shipping complimentary copies. I’ve signed a contract for the production and distribution of the ebook or epub version of the print book. The ebook won’t be available until the end of November or early December. I had four proposals and chose to work with a designer that expressed an interest in the subject matter. This is a big book and it helps to have your heart it in as well as your pocketbook. The ebook has already entailed more work on my end. 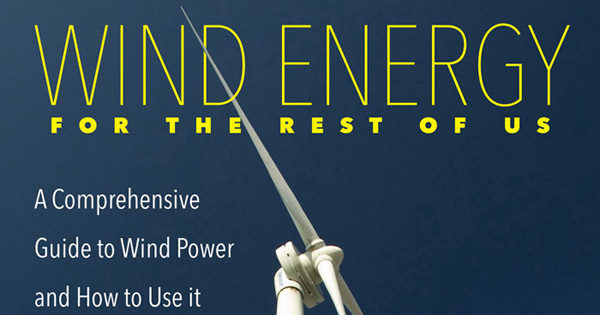 I’ve added a new section to pages on my web site promoting Wind Energy for the Rest of Us dubbed Tables. In this section I’ve uploaded an image and two spreadsheets (Quattro Pro and Excel) for each table in the book. There are 118 tables in the book. The intent is two-fold. First, users can follow a link in the ebook to the tables on my web site where navigation might be easier than in the ebook itself. Second, students, teachers, or other users of both the print and digital book can find the spreadsheets that I used to make the book. Tables are difficult to read on small devices, so the ebook will present the tables as an image like a photo or illustration. Thus, the reason for links to more detail. I’ve also added ten sample pages from the book to my web site. You can find them at Sample Pages. These are low-resolution pdfs that will give a sense of the book, its content, and design. All in all the book marches on and should be in print by mid month. The digital version will follow a few weeks later.